The traditional way of turning corn (maize) into tortillas pollutes large volumes of water and uses copious amounts of energy. Researchers at the biotechnology department of the Autonomous Metropolitan University of Mexico (UAM) are developing a greatly improved “greener” way of making tortillas. Tortillas cost less than a dollar a kilo in Mexico, but price rises for corn (and therefore tortillas) in recent years have caused the consumption of tortillas to fall to about 80 kg per person each year. According to the National Institute of Nutrition, tortillas account for about 45% of all the calories consumed in Mexico. Conventional tortilla mills cook the corn in a solution of calcium hydroxide (limewater) and then ground it into a dough. The process, known as nixtamalization, was originally developed in pre-Hispanic times. A ball of dough is then flattened into a round which is cooked on both sides on a hot comal to produce a tortilla. Residue from the nixtamalization proces contains starches, cellulose and calcium and is discarded into local drains. About 54% of all the tortillas consumed in the country are made this way. The remainder come from a ground corn-flour mix to which water must be added to form a dough, marketed by giant commercial producers such as Maseca and Minsa. Processing a single kilogram of corn for tortillas the conventional way requires two liters of water. There are 20,000 corn mills in Mexico; each one can pollute more than 1,000 liters of water every day. The UAM researchers were able to reduce pollution by conventional mills by 80% simply by introducing a more efficient filtering system for the cooked mass, allowing more dough to be extracted. The researchers have now turned their attention to energy usage. Using solar energy to help heat the water should reduce the amount of natural gas required by as much as 40%. This could save mills a considerable amount of money. 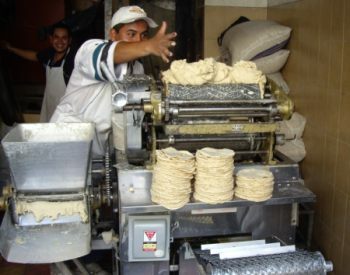 Each mid-sized mill (supplying dough to an average of 10 tortilla factories) spends about 2,300 dollars a month on energy.